It is no secret that I rate the Balbo Beard Co products very highly, the brand is one of my Golden Beard Award brands where the brand itself is awarded that and not just individual products. I have probably reviewed about 90% of the Balbo Beard Co products and I am yet to be disappointed! Rhian sent me the new #13 beard balm and oil and of course I chose to use the balm first, I love a good beard balm and would if I had the choice use balms all the time. As I scooped out some of the #13 balm and applied it, the thought that popped into my head was. A beautiful smooth consistency, easily scooped from the jar and yet firm enough to give a nice hold and keep my beard looking and feeling good. It is a blend of Shea Butter, Beeswax, Hemp Seed Oil and Argan Oil and you can just feel that these are decent quality ingredients. The scent for the new #13 is Black Pepper, Bergamot and Sweet Orange, now not only is it a new scent for Balbo but it is also different in that it is muted, usually the Balbo scents are vibrant. But it is everything you would expect from that blend, sweet citrus with the slight warmth of the black pepper and whilst I can’t fault it, I do prefer the Balbo scents that have more oompphh! 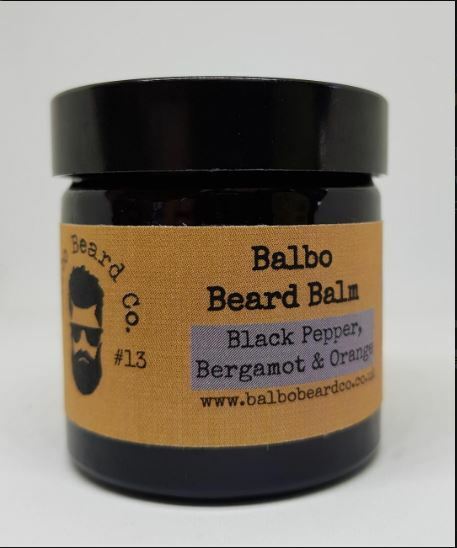 The Balbo Beard Co #13 beard balm is available in a 15ml jar for £5.99 and 60ml for £15.99 from the website.